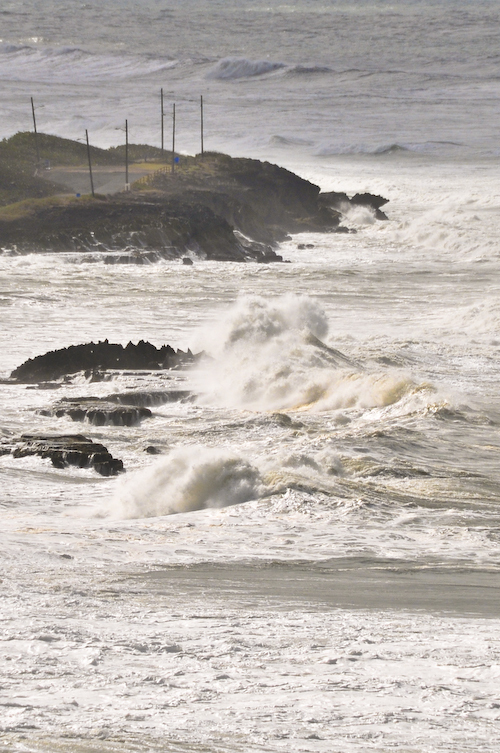 – NOAA, 19 MARCH 2008, San Juan PR. So began the day in Puerto Rico when my daughter and me arrived to enjoy a few days over spring break. We had originally intended to take the ferry to Culebra for a day of sun and fun, but the 30 foot waves at sea caused all ferry service to Culebra and Vieques to suspend for several days. 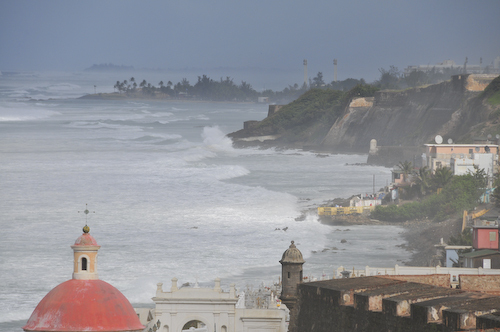 The view above was taken from Old San Juan looking eastward towards Condado and Pinones. Flooding in Pinones was extensive, causing evacuations and road/beach closures. Video footage form the local TV stations captured storm surges of several feet in some areas. The wind, surf and sea spray were pretty amazing. 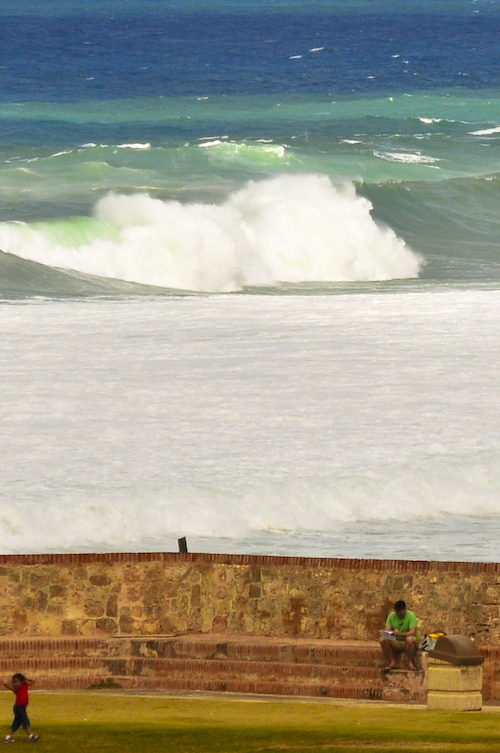 These waves breaking near El Morro were 20 to 30 feet tall! It was also spring break for school-aged children in Puerto Rico, and the added benefit of high winds made kite flying a necessity. Kites weren’t the only fliers today. Birds of all kinds enjoyed the constant breeze, including this Brown Pelican (Pelecanus occidentalis), which is the smallest of the eight species of pelican, although it is a large bird in nearly every other regard. It is 106-137 cm (42-54 in) in length, weighs from 2.75 to 5.5 kg (6-12 lb) and has a wingspan from 1.83 to 2.5 m (6 to 8.2 ft). This bird is distinguished from the American White Pelican by its brown body and its habit of diving for fish from the air, as opposed to co-operative fishing from the surface. 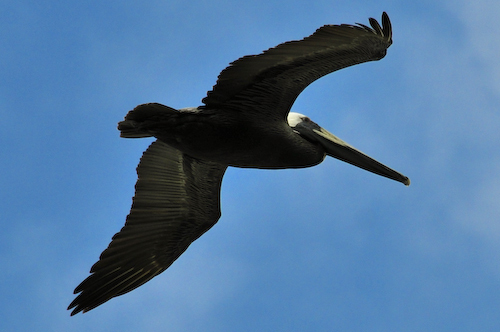 Groups of Brown Pelicans often travel in single file, flying low over the water’s surface. It eats mainly herring-like fish. IALA System A everywhere else. The two systems differ principally in the colors used to denote the two sides of a channel. When approaching a harbor from seaward, System A places conical green marks to starboard and cylindrical red ones to port. In System B these are replaced with conical red marks to starboard and cylindrical green ones to port. This can be remembered (for System B) with the mnemonic “Red, right, return”. Another System B mnemonic, which also helps with buoy numbering is “Even Red Left Port” (as in Eric the Red) – Even Numbered buoys are red, on your left (port) side leaving port. 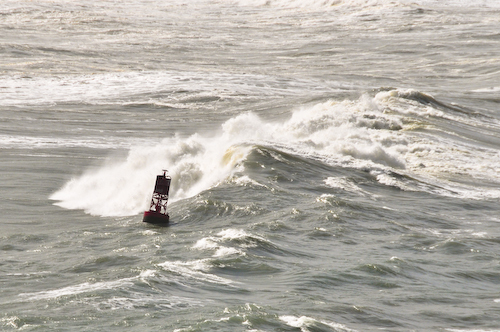 In any case, since in many harbors it is not always apparent which direction is seaward, buoys should be used in connection with the appropriate nautical chart. Additionally, since marks may be off station due to collision with ships, storms or other factors, they should be used with caution and not relied on solely for navigation. ~ by John on March 20, 2008.